The JEDI Cloud, which could result in a contract worth $10 billion over the next 10 years, will be a single contract, but could be assigned to multi-vendor partnerships and include multiple clouds. 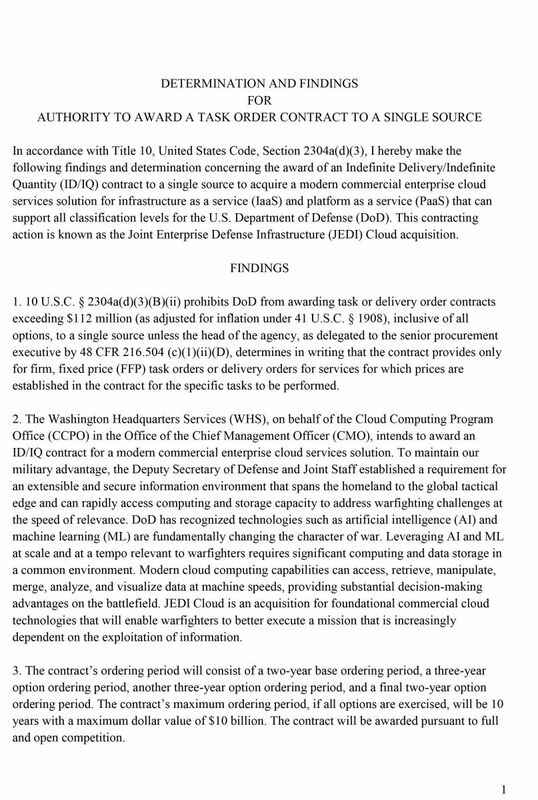 The U.S. Department of Defense has finally released its request for proposals for its planned $10 billion JEDI Cloud contract, one that is slated to be signed with a single cloud service provider. The Department of Defense on Thursday released its final request for proposals for the Joint Enterprise Defense Infrastructure, or JEDI, Cloud program. The JEDI program is expected to eventually give a single cloud services provider a contract worth $10 billion over 10 years. However, the DoD told CRN that the contract might also be won a partnership of multiple providers. The plan to award a single contract for the JEDI Cloud is a controversial move in the IT industry, given the size and scope of the eventual contract. It may also be a difficult project for which to prepare bids, especially for partnerships of multiple providers, given that the DOD will hold one-on-one meetings in August with potential bidders and select the contract winner in September. The request for JEDI Cloud proposals was initially expected to be released this past spring, but was delayed. The contract generated major controversy as large technology providers argued that the huge contract appears tilted in favor of Amazon Web Services, and should be divided among vendors. The Information Technology Industry (ITI) Council's IT Alliance for Public Sector, a group that's comprised of all the cloud providers involved in the dispute, previously argued that a multi-cloud approach would adhere to best practices for ensuring price competitiveness and avoiding vendor lock-in. Opponents of the DOD's plan maintain the conditions stated in two previous draft RFPs look written to ensure AWS takes the entirety of the contract. A coalition of tech giants came together around Oracle's protest, including Microsoft and IBM, two of Amazon's most-prominent cloud rivals, as well as hardware giants Dell and Hewlett Packard Enterprise. 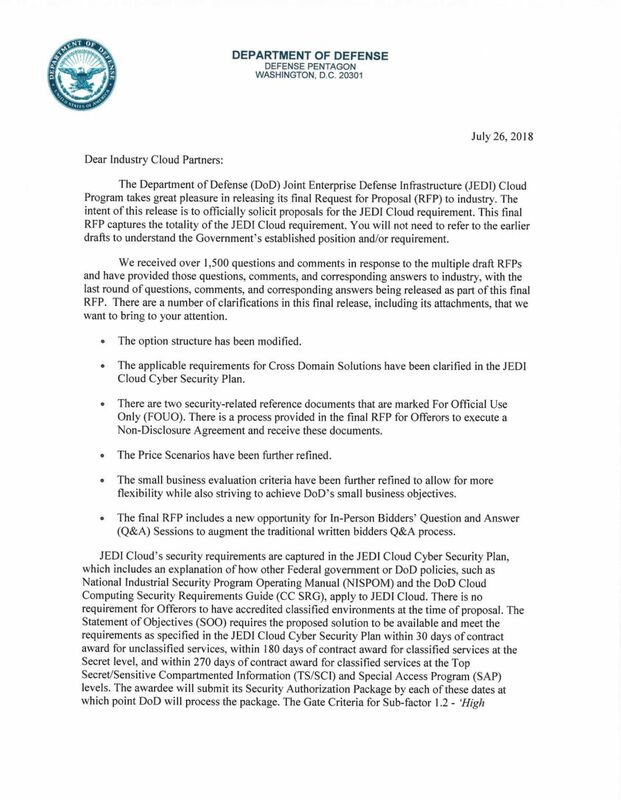 Heather Babb, a Department of Defense spokesperson, told CRN via email that while the JEDI Cloud is a full and open competition that will result in a single-award contract, it does not preclude multiple vendors from participating in the project. "Multiple vendors may form a partnership and offer a solution to compete for the single-contract award. Extensive market research has shown that multiple vendors are capable of meeting the requirements of the department," Babb wrote. "The JEDI Cloud is a critical first step toward an enterprise cloud solution that enables data-driven decision making and allows DOD to take full advantage of applications and data resources. While JEDI Cloud is an initial step toward a department-wide cloud solution, DOD will continue to operate in a multi-cloud environment due to diverse mission needs," she wrote. Babb also wrote that, since the RFP has been released, the DOD cannot comment further on a pending competitive action. In announcing the request for proposals for the JEDI Cloud program, Dana Deasy, chief information officer for the Department of Defense, on Thursday called JEDI Cloud a "pathfinder" and a key component in the department's cloud environment strategy. An enterprise approach to cloud technology is the only way to get the scale needed to quickly provide the military with access to the best information needed for informed decision making, Deasy wrote. "The JEDI Cloud Program is a pathfinder and a critical first step in the DOD's overall cloud environment that will provide an enterprise approach for obtaining general purpose infrastructure and platform services that can meet a majority of the department's needs," he wrote. 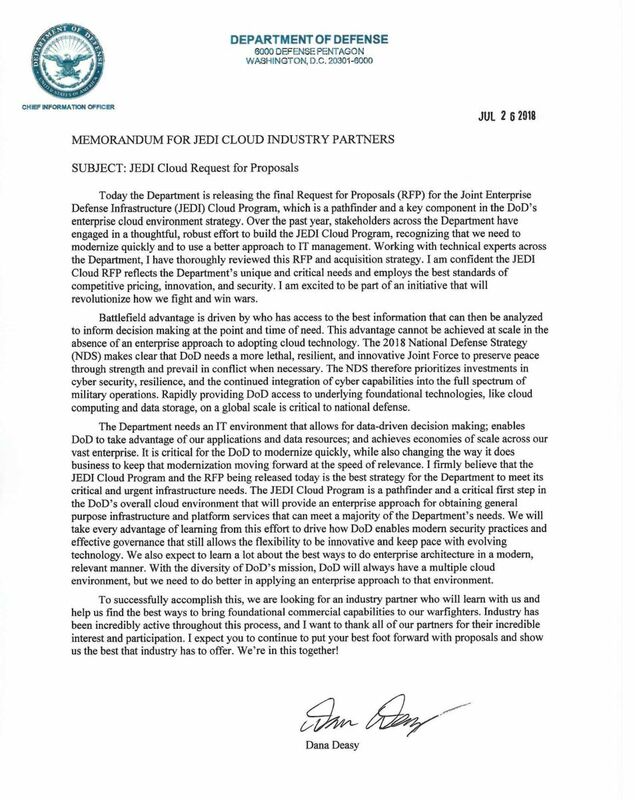 While the DOD is expected to choose a single cloud provider for JEDI, it is not looking for a single cloud, Deasy wrote. "With the diversity of DOD's mission, DOD will always have a multiple cloud environment, but we need to do better in applying an enterprise approach to that environment. To successfully accomplish this, we are looking for an industry partner who will learn with us and help us find the best ways to bring foundational commercial capabilities to our warfighters," he wrote. Kaight Meyers, a lieutenant colonel in the U.S. Air Force and the JEDI cloud computing program manager, wrote in a separate letter that the JEDI cloud project is an important part of helping the DOD understand how to best use the cloud. "This production contract is key to allowing the Department to learn how to most effectively use cloud at the enterprise level. The JEDI Cloud will act as a pathfinder for us to understand how we can best achieve security, governance, and architectures at the enterprise level in a modern, relevant manner," Meyers wrote. One potential bidder for the project, Oracle, declined to comment for this story. Sam Gordy, general manager for IBM U.S. Federal, told CRN via email: "IBM has proudly supported the U.S. military for decades, and we look forward to submitting a thoughtful, comprehensive proposal for a JEDI cloud that will serve the long-term needs of America’s men and women in uniform." Representatives from Microsoft, Amazon, Dell, and HPE did not immediately respond to CRN requests for further comment. Ellen Lord, under secretary of defense for acquisition and sustainment, wrote in a letter dated July 19 that the JEDI Cloud project is expected to leverage artificial intelligence and machine learning. "Leveraging AI and ML at scale and at a tempo relevant to warfighters requires significant computing and data storage in a common environment," she said. Lord also said the contract will start with a two-year base ordering period, a three-year option ordering period followed by a second three-year option ordering period, and a final two-year option ordering period, with the maximum cost to be $10 billion over those 10 years. The contract includes multiple contract line items for IaaS, PaaS, and cloud support packages which will be priced by catalogs, with each offering in the catalog provided "as a service" with single, fixed unit prices. "As with any other cloud offering, once [a] new service is added to the catalog, the unit price is fixed and channel be changed without contracting officer approval, she wrote. The planned $10-billion budget for JEDI over the next ten years is a huge project compared to the Department of Defense's other cloud computing budgets. In a redacted Congressional report on cloud computing services, the DoD plans to spend about $82.1 million on nearly 50 commercial cloud service projects in fiscal year 2018, rising to $106.8 million in fiscal 2019. Another $147.8 million is expected to be spent on "other" cloud services for about 50 DOD projects in fiscal 2018, rising to $286.4 million in fiscal 2019. Joseph Tsidulko contributed to this story.